It’s nearly Christmas! Hurrah! To celebrate I am joining the happy crew at Salariya for their Twelve Days of Christmas festivities. 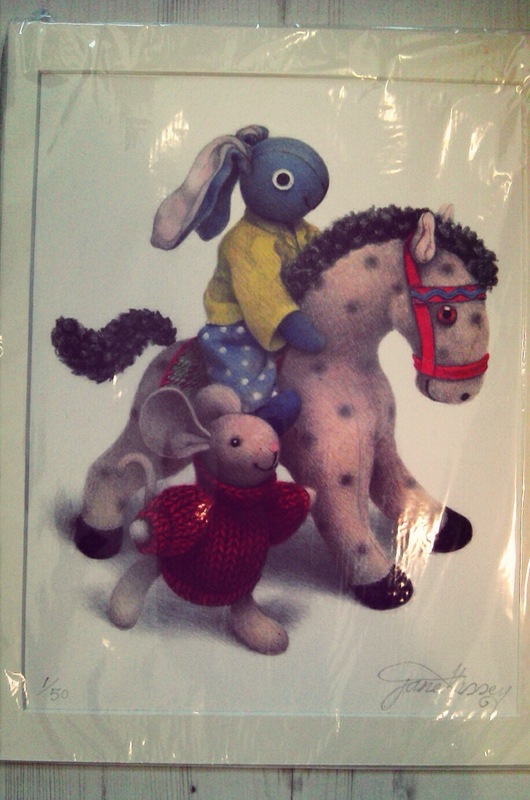 I have the pleasure of giving away a SIGNED print featuring Blue Rabbit and Blanket the horse from Jane Hissey’s latest book Ruby, Blue and Blanket. (Please excuse the photo quality- but this print is so precious that it can’t be released from its protective cellophane, not even for a photo shoot). An amazing prize in itself but I would like to draw your attention to the little numbers at the bottom of the picture…. YES, it’s print number 1! You could win the very first one of only 50 prints, signed by Ms Hissey! Excited much? All you have to do is post a comment below by midnight tonight and I will announce the winner on here and via twitter tomorrow morning. UK only I’m afraid. You can share (tweet, reBlog or share on Facebook) this competition link (https://rhinoreads.wordpress.com/2013/12/10/win-a-signed-jane-hissey-print-with-salariya/) for extra chances to win BUT for these extra entries to count you must enter each of them as a separate comment on this blog, as I’ll only be drawing a winner from these comments. The Rainbow Library IS WORKING!!!! Used to read Jane’s books to my little brother, so beautiful – and so much nostalgia! Great competition. Good luck, all – hope you get lots of entries. Such a lovely picture. Ruby, Blue and Blanket are definitely on their way. Goodness what a fantastic prize – we would love to give it a good home! It’s a really lovely picture. They look like they are going off for some fun! My daughter adores Jane Hissey, so yes please, we’d love to win! Genius! I would have given you an extra entry for that cunning plan! Wow, what a great prize, my daughter is so excited, fingers crossed! What a wonderful prize! Jane Hissey’s work is magical. Ha! You’re not the only one! Imagine how I feel!!! three times I’ve shared. I must be batting short of a quilt now! Good luck to you too! and I can’t believe I’m shortening the odds against me by sharing it a third time on my personal FB page too! Would love to win this wonderful print. Jane Hissey is one of my favorite artists. I have shared this through Facebook. I have just shared on Facebook. And I have tweeted the competition as @alicomps too. What an incredible prize. My better half idolises the work of Jane Hissey and she would love this dearly. I would love to have this beautiful picture on my bedroom wall! It would be amazing to win this so near to Christmas! I would love to win this beautiful picture! I would love it on my bedroom wall so near to Christmas! Wow, lovely! Please count me in! I just can’t believe these beautiful illustrations are created using drawing pencils. albeit good quality ones. I’m such a huge fan! Would love to add this to my Jane Hissey collection. What a wonderful talented lady! I have retweeted this too and I am excited see if I win! I hope Americans are eligible!